This website presents our work on learning a local feature descriptor for 3D LiDAR scans. We use a Siamese CNN for learning the feature descriptor and a metric for matching the descriptors. An illustration of keypoint matching using our learned feature descriptor. 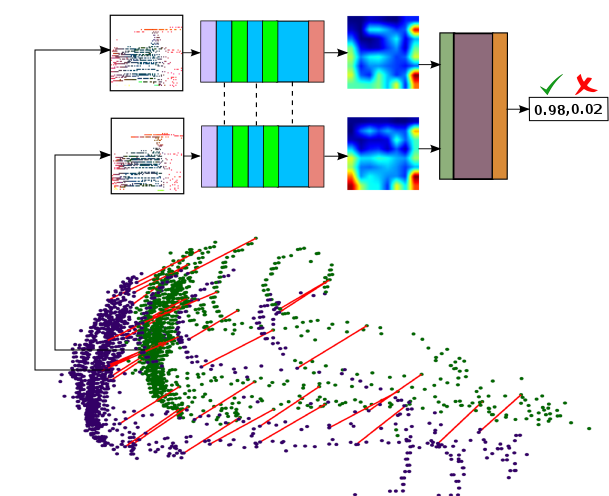 Surface patches around the keypoints are passed through the feature learning network to estimate feature descriptors. These descriptors are then passed through the metric learning network to estimate a matching score. Red lines show the correspondences between the keypoints in the two 3D LiDAR scans. We provide the scripts to train the model and a C++ library to interface the learned decriptor with PCL. We also provide the training and testing data used for learning the descriptor and example data to use the C++ API. For more details please refer to the GitHub page.